Well, well, well. It looks like everybody’s favorite limited social networking and photo-sharing app has finally come to Android. That’s right, Path has announced via its blog that, beginning today, its app will be available in the Android Market. Check it out. But, while the app is officially on Android, this is apparently not a finished product. Path considers Version 1.0 of its Android app to be a public beta, and will be using it to test the Android waters to learn what works and doesn’t work as it ports to a new mobile OS. This maiden voyage for Android has quite a few features that Path users have become familiar with, but according to Path Co-founder Dave Morin, there’s definitely more to come down the road. But, ‘will Path Android users hang around to find out just what those are?’ that’s the question. 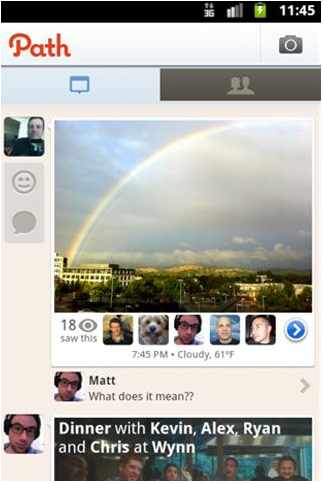 For those unfamiliar with Path, the startup was founded in 2010 by Dave Morin and Dustin Mierau as an alternative approach to the idea of broadly sharable social information, as Path targets sharing among a smaller group of close friends and family. 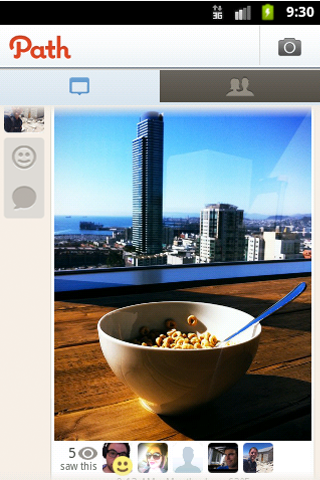 With a 50 friend limit, Path chose to offer no outside sharing features, Facebook, or Twitter integration. The team later amended this a bit by adding a complementary app for Twitter photo sharing called With and has added a host of features, like Stacks, etc. Since its inception, the startup has grown in fits and starts, but has been on a kick this year, turning down a $100 million acquisition offer from Google and raising an $8.5 million round from Kleiner and Index, and more. Though the app got its start on iOS and has grown its feature set on Apple’s platform (and has taken its sweet time in expanding beyond iOS), today confirms that there’s not actually any OS bias over at Path. And to be fair, it seems par for the course today for app developers to start with Apple before moving to Android. As is such, Path’s Android v1.0 won’t be offering the full suite of features available on iOS, but it’s a good start. With Android, users can capture and share photos with the same 50-friend limit, tag moments with people, places, and things, view friends’ moments, and make use Path emoticons to let friends and family know how you feel about their pictures and moments. Users can also take advantage of chat, see when friends have viewed their moments, and publish a few moments to Facebook. And apparently there’s more to come. As Path’s blog entry indicates, the startup will “continue to iterate and release updates with more features frequently”, and users can expect things to improve “rapidly” as Path continues through beta. A few quick additional notes: Some users have pointed out that currently the only way to authenticate or sign up for the Android app is through Facebook Connect, and that the Facebook permissions are pretty invasive. While this could scare some users away, Morin told me that, for now, Facebook Connect with remain the primary form of authentication, just as it is on iOS and the web, but the team will be adding email signup to Android in the near future. Version 1.0 also does not include the ability to delete posts, which is a bummer if you share some of those inappropriate private pics, but Morin said that this feature, too, will be arriving shortly. Good things come to those who wait, right? Path is currently available for users of Eclair version 2.1 and up.